An SPCA in Tennessee needs your help to save nearly 250 dogs, many of them beagles, rescued from a possible puppy mill. The dogs were found at a home in Bradley County. Originally they thought it was a hoarding situation, but now they think it's a puppy mill. According to WRCBtv in Chattanooga, neighbors often complained and knew something was going on, but the authorities didn't do anything. "According to volunteers, many of the dogs were crammed five to a cage and standing in their own feces. "It tugs at your heart when you walk in there and you see people keeping animals like that. I mean it really does, makes you want to try and save them all," said Karen Maxwell, Volunteer. Some of the dogs were taken to rescue centers, while others were being shipped straight to the animal hospital barely alive." Stop and think about that for a second. 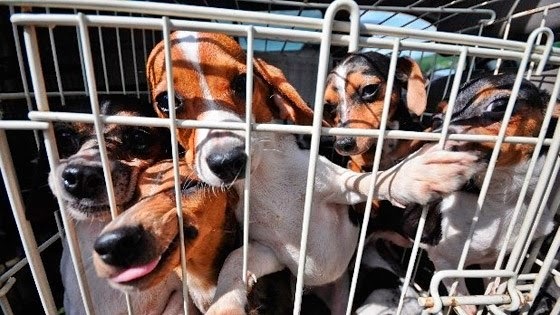 Beagles crammed five to a cage and standing in their own feces. Some barely alive. If this was a hoarding mill situation it would be bad enough. But if this was a puppy mill, these dogs were being sold. What were people buying? What kind of condition were these animals in? Were they being sold to regular dog owners, or hunters, or for research use? Puppy mills are bad news, guys. Bad bad news. Know who you are buying from and what you are buying before you do so. SPCA of Bradley County announced Friday that the Humane Society of the United States would be helping care for the dogs. Now the dogs won't be available right away. HSUS and SPCA will assess the pups before they foster or adopt them out. Office supplies, stapler, pens, highlighters, post it notes, copy paper, receipt books. We also need vinegar, drum liner garbage bags, a wheel barrow or cart to haul laundry, we are out of paper towels, brooms and mops. They also need bowls, leashes and crates. Please share this story with your fellow pet lovers, and any rescues you know. The more dogs that can be rescued from the shelter, the easier it will be to care for these puppy mill dogs. You can donate directly to the SPCA of Bradley County, TN online HERE on their website. And you can call them at 423-790-1915. Hi Christie - Thanks for this. It does break your heart. I have a big box of supplies I've been meaning to take over to Bideawee here in NYC, but I'm going to go through it today and pull things for the SPCA of Bradley County. Thank goodness these dogs are out of there and on their way to a better life. Jody! Thanks for donating. that's amazing. This is heartbreaking. How could someone have the heart to do something like this to these poor creatures? Thank God they were reported and saved just in time (for some). Great work SCPA of Bradley County.